First we should pinpoint exactly what a 'toccata' is. The word means 'touch piece' and its earliest mention dates from the first part of the sixteenth century. Composers still use the word although it was J.S. Bach who employed it most famously. A toccata is generally fast-moving, light and often virtuoso. It can be imitative - indeed Merulo adopts that technique. It is normally fantasia-like in form and exploits the entire instrument. The tempo is often rubato but certainly changes often. 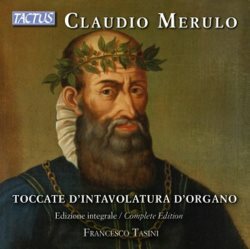 One of the most prolific composers of toccatas was Claudio Merulo who is often remembered in music text books as the most significant predecessor at St. Mark's Venice, of the Gabrielis and therefore of Monteverdi. In his life-time he was much admired and sought after. On leaving Venice in 1586 we find him working for the Duke of Parma and at the city's Duomo. These three well-filled CDs contain the entire, currently known, Toccatas by Merulo. There are the nine from the Libro primo engraved in Rome in 1598 and found on CD 1. The ten toccatas from the Libro secondo, also published in Rome but in 1604, take up all of disc two and some of disc three. Finally there are seven Toccatas from a manuscript found in the Biblioteca Nazionale in Turin. These are slightly different in style, having a fuller chordal writing enlivened by embellishments. The two printed books, according to the fascinating booklet notes by Francesco Tasini himself, can be regarded as one. "The Toccatas are arranged according to the order of the ecclesiastical tuoni" or modes. "Each tuoni has two Toccatas assigned to it" with just a couple of exceptions. The technicalities of the modal background are further discussed but that need not concern us here. Later Tasini adds, in a slightly curious translation, "the composer has carried out his ornamentation action starting from a basic framework that hinged essentially on counterpoint and imitation". What this means is that whilst one hand sustains a chord, - a harmony - the other will invent around it what the Italians call 'passaggiato' -ornamented passing notes. These will be exchanged between the hands. He continues: "The two books of Toccatas reveal their derivation from the finest chamber music and their kinship with the 'secluded, secret precious music' of court settings." For me, the music is ostensibly solemn - listen to the beautifully haunting Toccata 6 on CD 1. It is related to the psalm chants and is meant to be heard in the context of the liturgy. One can imagine the priests moving in the sacred space, processing, secretly saying words of consecration or elevating the host or music to be heard even before the service. Dependent on the mode it can be serious and grave as with CD 3 track 4, the Toccata seconda or bright as with CD 1 track 3. Two organs are used. The first disc was recorded on the Organ "in cornu Evangeli" made by Baldassarre Malamini in 1596. It's still is in regular use in the church of San Petronio in Bologna. The other two discs were recorded on what seems to me to be a more versatile instrument in Mantova - the ducal chapel of the Gonzagas in Mantua - at the church of Saint Barbara. This dates from 1565 and was designed by Graziadio Antegnati. The two specifications are given in the booklet. The Bologna organ includes three stops marked as 'Vigesima', seconda, sesta and manona. The Mantua instrument has a 16 foot Fiffano as well as two flute stops, one being 8 foot and the other 2 and 2/3rds. Each Toccata is given a different set of stops, so on CD 1 the Toccata quinta is played on the Ottava, the Quintadecima and the Vigesimaseconda as well as the four foot flute stop. This adds to the variety - needful because the music moves along at the same pace and in a very similar style throughout. Amongst the most arresting of the Toccatas is the Quarto - 'di Ms. Caludio per l'organo' to give it its full title - on CD 3. Tasini describes it as sumptuous, exuberant and extremely extensive in ornamentation. Francesco Tasini's achievement in recording well over three hours of this music is not to be underestimated. Although not always virtuoso, these pieces are challenging, not only from the point of view of articulation and colour, but also for the concentration required to get through lengthy passages and phrases that seem to arrive at a cadence only to move on quickly to the next long-held chord. The recordings are consistent in balance and tone quality. There are none of the extraneous noises that can sometimes haunt organ recordings. Even so, this is specialist repertoire more suitable for the library and for reference than for any sort of regular listening. It would be unwise to listen to too many in one sitting. From musico-historical standpoint it's worth a student taking the language and development of Merulo's Toccatas on board. For anyone with an interest in early organ music these discs are worth exploring.